So today, we’re moving to the Top 5 Best Designs of 2014 in the NHL. Yesterday, we did the Top 5 Worst Designs of 2014, and you can read that here. Why worst first? Because you always pick the bad news before the good news when given the option. Always. And remember, these are the Top 5 Best Designs that were announced in 2014, so no Sochi Olympics here. We covered that last year. Everything old is new again. Bringing back jerseys that have a legacy of excellence and championships – as well as being one of the best jerseys the team has ever worn – as an alternate third jersey is almost always a good thing. 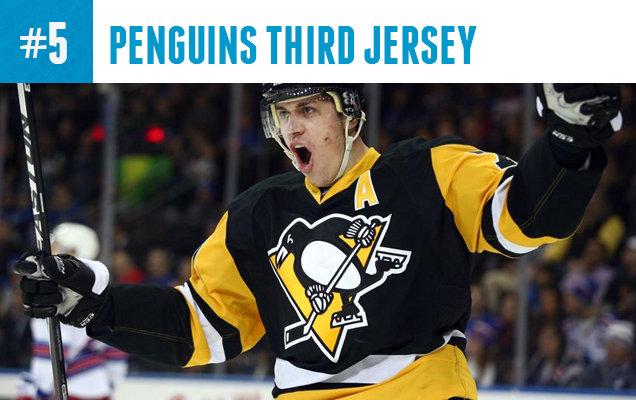 While the Penguins have changed alternates as much as Megadeth does bandmates, these are more iconic than the cummerbund jerseys that they wore for the previous few years. 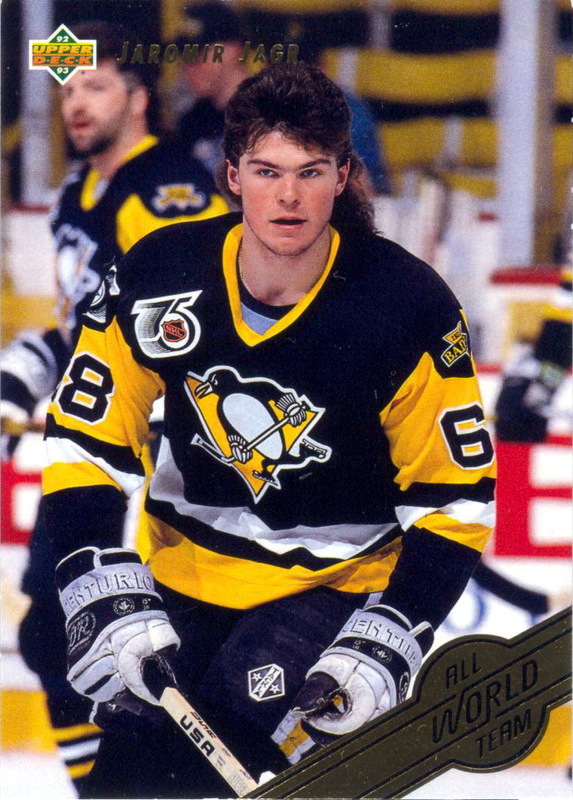 Now if they would just trade for Jagr and let him wear it one more time, that’d be something. One of the very first posts on this site was how horrible the old Anaheim Ducks’ logo was. Oddly shaped, ill-designed, with seemingly no consideration for where it would be seen, it’s a relief that it has become official that the Ducks’ alternate logo from the past few years is now their primary logo. And that old, awkward logo is now in the relics of history. 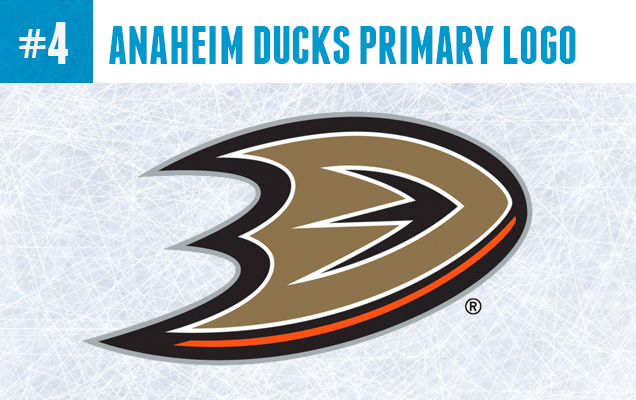 That change alone ensures that the Ducks no longer have the worst logo in the entire league. That’s not to say that it’s a fantastic logo or one of the top in the league (because it isn’t), but maybe it’s time for a BTLNHL update? 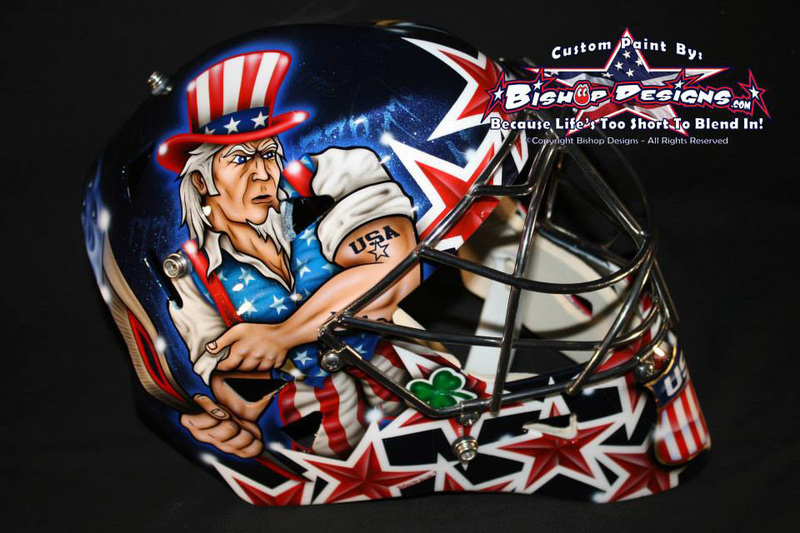 The only sanction of individual expression on NHL uniforms is the goalie mask, and goaltenders make full use of it, coming out with new masks almost every season, sometimes with two or three. 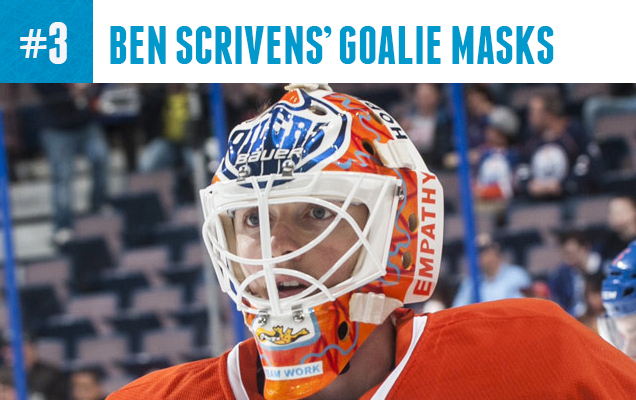 Any while there’s flaming skulls, weird monsters and Americana a-plenty, very few puckstoppers use it for an important and worthy cause like Ben Scrivens has this season, bringing awareness to mental health by having a series of masks designed by people with mental illness. Scrivens may not be having the best season, but he deserves kudos for this. Finally, the Blues got it right. They’ve had a bunch of jerseys that they’ve worn since 1967 that vary between good, so-so and not bad (aside from those awful late-’90s jerseys of course, which were just awful). 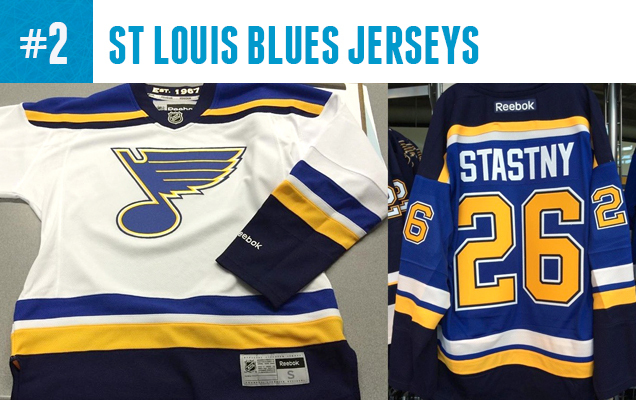 Here, they incorporated some of the most successful elements from those jerseys to create a set that looks familiar, authentically Blues-y, and miles ahead of anything they’ve worn so far in their existence. The shoulder striping in simple and refined, the striping everywhere else is strong and consistent, and they’ve made the two tones of blue work really well. 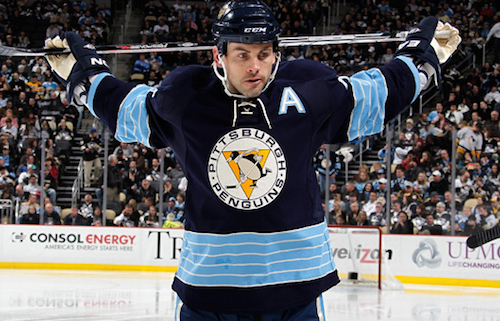 Some people won’t like these jerseys, but they are fantastic. 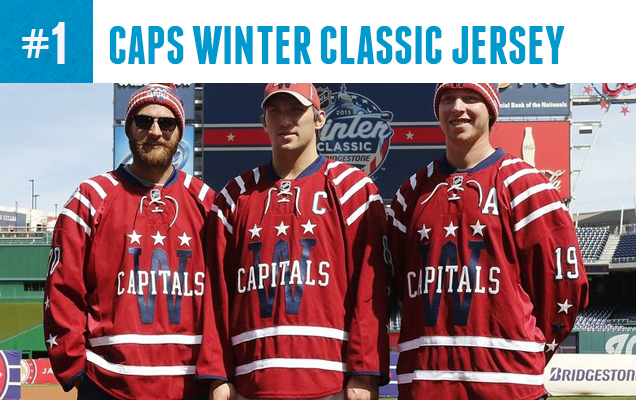 There’s historical elements commemorating Washington hockey history as well as NHL jersey design, with the logo they’re wearing to the use of stripes. There’s nods to Washington, DC itself, with the Washington Monument in the ‘W’ to the three stars on the DC flag. Then there’s innovative elements incorporated, like the striped shoulder yokes. Then there’s connections to old Caps jerseys, like the stars on the sleeve. Bringing all of this together into a design that is still cohesive, relatively simple and looks old and new (and good) at the same time? That is a monumental design feat, and deserving of the top spot. Agree? Disagree? What was your favourite design of 2014? Let us know in the comments below. Don’t forget, we counted down the worst designs of 2014 yesterday.